Job longevity is becoming more rare these days. An employee staying at a job over 5 to 10 years is almost shocking. It’s not because people are fickle, but industries cycle and positions are cut. As employees, we often get locked into tunnel thinking. Our job title becomes our identity and we can forget that we do so much more outside of work. That’s a scary mindset when you can lose your job at any time. Here today, gone tomorrow. Ask around the office and I’m sure you’ll find that the finance guy is a wine connoisseur or your PR guru teaches yoga on the weekend. We all have lives outside of the office. 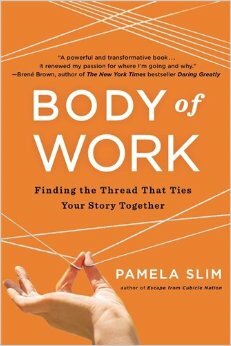 Body of Work, written by Pam Slim, is a guide to help transform your thinking from the Dilbert mentality of corporate and tie together all of the things that make you, you. It serves as a reminder that we are whole people with a body of work that encompasses all that we “create, contribute and, affect and impact” in the world. You’ll read stories about people who followed their passion, embraced the fear and reached for the stars. It’s not just about entrepreneurship, it’s about defining, embracing and building your entire body of work. It’s a life-changing read that will give you the tools to help you tell your story. When you view your life and career as a whole, not just the 8-to-5 part, you can create choice, financial security and freedom. What is your passion outside of the office? This book review includes the thoughts and opinions of the blog owner. No compensation was exchanged for this review.